The Madrigals program will include a variety of classical and popular music, folk songs. 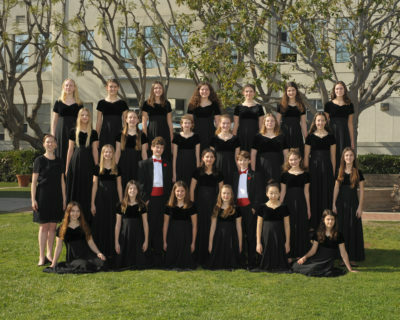 The Madrigal Singers are an audition-based a cappella ensemble at Santa Monica’s Lincoln Middle School. The young singers meet once a week to rehearse and focus on Renaissance through contemporary a cappella choral literature. Recipients of top ratings in Southern California Festivals, they have been guest performers at local elementary schools, cub scout holiday meetings, and the Aga Khan Foundation Walk. LAEMMLE LIVE proudly presents Kaleidoscope, Los Angeles’ award-winning conductorless chamber orchestra. Benjamin Hoffman, Chiai Tajima, Alex Granger, and Clement Chow will perform the Bartok String Quartet 5 and Mozart Dissonance Quartet. 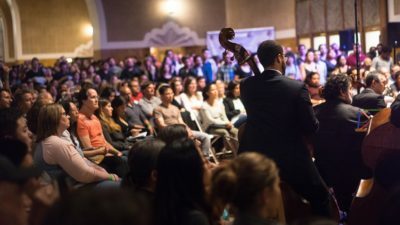 Dedicated to enriching lives through concert experiences and artistic excellence, the orchestra makes profound connections with diverse communities of Los Angeles, performing music that speaks profoundly, whether written today or centuries ago. We stretch the boundaries for what is thought possible without a conductor, both by musicians and audiences, to allow us all to grow through the process. We regularly collaborate with living composers because their music represents our time. We design programs that explore less conventional concert experiences and allow audiences to feel more personally connected to music and the musicians who perform it. Kaleidoscope is committed to music education for all ages and is happy to offer a ‘pay what you can’ model to eliminate the barrier of a set ticket price. We want everyone in Los Angeles to have the opportunity to experience great classical music in person by a professional orchestra, think about what that experience means, and pay what makes them happy. We also perform many additional free concerts in schools, hospitals, shelters, and other underserved parts of our community. We recently started a music education program at a Title I elementary school in Culver City, providing music instruction to 100 first grade students each week. With additional funding, we are planning to expand this program to other grades and other schools in the future. Not only do we want every child in Los Angeles to love listening to music, we want every child to have the opportunity to read, play, and write music, too. Come celebrate with LAEMMLE LIVE! 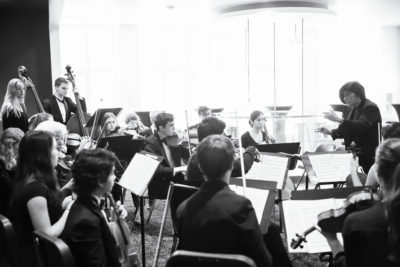 It’s our first anniversary and we are launching season two with an encore performance by Santa Monica High School’s Chamber orchestra performing Bartök Divertimento and solo works. Joni Swenson and Jason Aiello, Music Directors. Guest host KUSC Announcer Rich Capparela, who opened our series last year, shares his musical wit and wisdom. Samohi has a long tradition of musical excellence. Several factors contribute to the strength of the music program including strong elementary and middle school programs, a supportive community, and an outstanding music faculty. Courses offered are Beginning Orchestra, String Orchestra, Concert Orchestra, Sinfonia Orchestra, Philharmonic Orchestra, Symphony Orchestra and Chamber Orchestra. 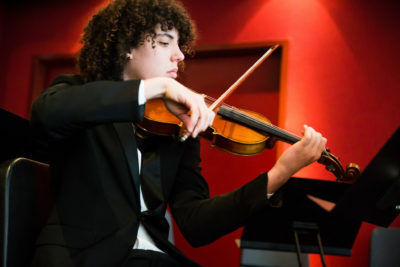 Students receive one hour per week of sectional small group instruction taught by paid coaches funded by the Samohi Orchestra Parents Association. Join us January 21. Come for the music, stay for the cake! Will accept walk-ins space permitting! Join us December 3 at the Monica Film Center as we usher in the winter holidays with the joyful sounds of ELEMENTAL CHOIR. 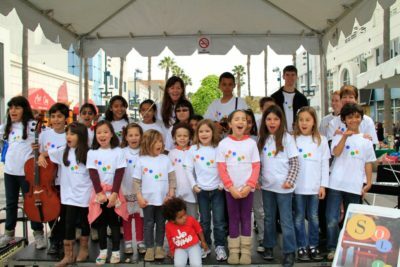 The choir is a program of Elemental Music, created to inspire, train, and nurture young musicians in Santa Monica. 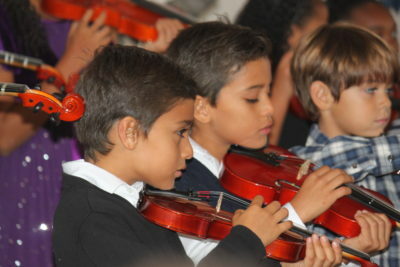 The program began in 2004 by an SMMUSD music teacher who wanted to create an opportunity for elementary students to play in an orchestra throughout the school year, make new friends, and get excited about music. Since then, more than 1,000 students have participated in Elemental Music. Initially serving only 25 elementary school students, programs now serve nearly 300 elementary and middle school students in seven different programs this season. Elemental Choir is one of Elemental Music’s newest and fastest growing programs. The Choir is comprised of third, fourth and fifth grade auditioned singers from over ten different Westside elementary schools. Teachers in the community recognize that engaging staff and inspiring repertoire choices help foster a strong sense of identity in young musicians. Our students work with expert teaching artists to polish their technical skills and dig into the joys of music-making, all in a social setting. 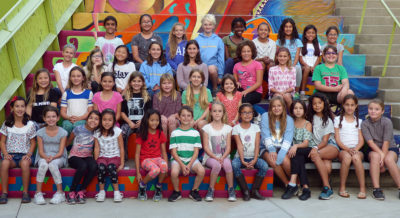 We offer many opportunities for student performances throughout the year at three different Elemental concerts plus various public events in the Santa Monica community. Elemental Music’s young musicians blossom in their own ways, both socially and musically. This vibrant program inspires a love of music in the hearts of some of the westside’s youngest artists. LAEMMLE LIVE IS ON THE MOVE for November only. We proudly present SOL-LA Music Academy and Saint Anne School in a collaborative musical concert on Sunday, November 5, 2017, at Laemmle’s Royal Theatre in West Los Angeles. SOL-LA Music Academy is a nonprofit music school in Santa Monica that provides high quality performing arts education to students from all backgrounds and economic circumstances in an engaging and encouraging environment fostering achievement and community. Their comprehensive program reflects the belief that vibrant cultural education nurtures all areas of learning, connects diverse societies and enhances the enjoyment of life. Saint Anne School is Santa Monica’s only nonpublic Title I school, with at least 40% of families qualifying as low income according to federal standards. The school serves a diverse population of families from 66 zip codes. Without SOL-LA, most of these students would not have access to the myriad benefits that a comprehensive music education can offer. The SOL-LA at Saint Anne School program, now in its seventh year, was born out of a desire to see music included as a core curriculum subject. As a parochial school, Saint Anne has the flexibility to include music as a priority rather than as an elective. Saint Anne partners with SOL-LA to bring high-quality music instruction to its students on-site, with an option for the students to further participate in after school instruction at SOL-LA’s campus. SOL-LA at Saint Anne School is a sequential music education program, providing free music instruction and instruments to 270 K–8th Grade students during regular school hours at Saint Anne. SOL-LA’s program at Saint Anne is thoroughly integrated into the curriculum; all students in all classrooms participate in the program. Additionally, SOL-LA provides instruments to students during the school year at no cost. 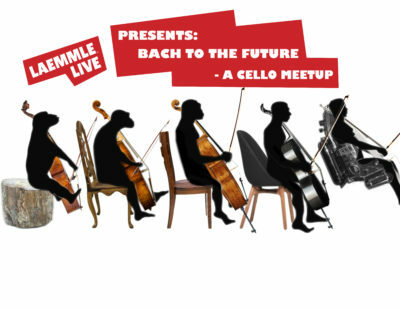 Laemmle Live proudly presents BACH TO THE FUTURE – A CELLO MEETUP, Sunday October 1 at the Monica Film Center. Internationally acclaimed cellist and dedicated pedagogue Antonio Lysy invites intermediate and advanced cellists to participate in a unique cello ensemble opportunity. Antonio will lead a cello ensemble in exploring music that spans the ages, from Palestrina, Bach and Dvorak to Bartok, Elvis and more. Cello students, please RSVP to laemmlecellomeetup@gmail.com by September 21 if you would like to perform and include the following information: name, years of study, and music part you wish to play. Families, friends and cello fans, please RSVP to the same address. Please check in with your teacher if you need direction. Music can be found here. Antonio Lysy, artist of international stature and dedicated pedagogue, has performed as a soloist in major concert halls worldwide. He has collaborated with distinguished conductors including Yuri Temirkanov, Charles Dutoit, Sir Yehudi Menuhin, Sandor Vegh, and Kees Bakels, and continues to perform regularly both as a solo, and chamber music artist. Lysy has recorded extensively for CBC Radio, BBC Radio, Classic FM, and other radio networks. Lysy enjoys exploring the versatility of the cello’s voice, from Baroque to electric, and is committed to projects which enrich his diverse interests in music. Based on his Latin Grammy award-winning CD, the touring multimedia show, “Te Amo, Argentina”, has met with widespread acclaim. 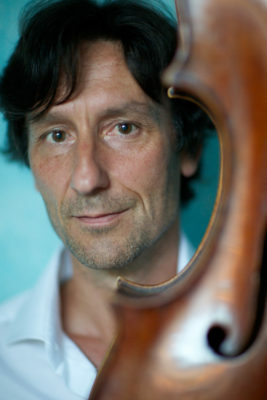 In the summer of 2003, Lysy accepted the position of Professor of Cello at University of California, Los Angeles. Prior to moving to the United States, he held a professorship at McGill University in Montréal. Ever since I was 12 years old and in the early days of my musical studies at the Yehudi Menuhin School in England, I have been fascinated with the process and notion of teaching. The idea of passing on a legacy through performance practice, and being part of an aural tradition entrusted to me by masters of the instrument is somewhat magical. It is the creation and preservation of history. I am fortunate to have had great opportunities in my life. While the idea of “giving back” has become cliché, I cannot think of a better term to explain my motivation to help those who have the talent, personality, work ethic, and determination to succeed. I am indebted to all my past teachers who took the trouble to share their experience, knowledge, philosophy, and passion with me, and inspired me by their dedication to musical ideals. Their example and belief in me as a young cellist stimulated the development of my own teaching philosophy. Many teachers were pivotal in my artistic development. Those I was fortunate to spend the most time with are the following: Guido Mascellini and Myra Chahin (in my early years), Alberto Lysy (my father), Maurice Gendron, William Pleeth, Radu Aldulescu, Yehudi Menuhin, and Ralph Kirshbaum. Coffee, Cantatas, and Conversation! Please join us Sunday, September 10 when LAEMMLE LIVE welcomes Los Angeles Baroque for a FREE chamber music concert. 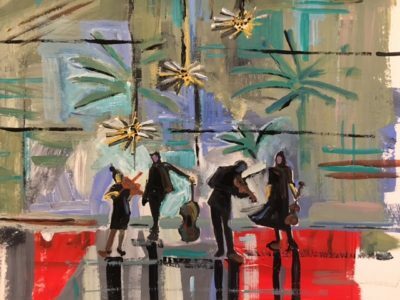 The baroque ensemble’s Westside debut will feature Bach’s Brandenburg Concerto 6 and a mini comic opera, A Coffee Cantata, in a new (and very funny) translation by Hugh Macdonald. Directed by Lindsey Strand-Polyak and Alexa Haynes-Pilon, Los Angeles Baroque (LAB) was founded in 2016. 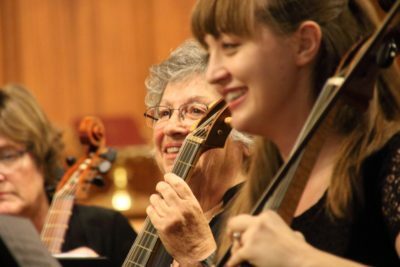 LAB enables dedicated professional, student and community musicians from greater Los Angeles to explore repertoire, learn Baroque playing style and perform. 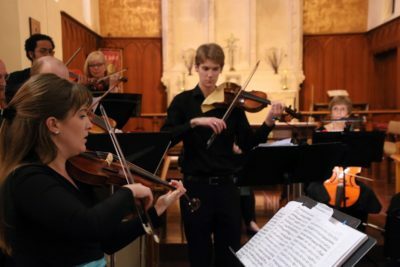 The group encourages and supports the early music community in Los Angeles in an inclusive environment to give highly motivated players more performance opportunities. This diverse group rehearses and performs regularly at St James’ Episcopal Church in South Pasadena. It doesn’t get much better than this! Sunday, August 13 LAEMMLE LIVE welcomes McCabes Guitar Shop for a free pop-up celebration of all things guitar, banjo, ukulele and harmonica. 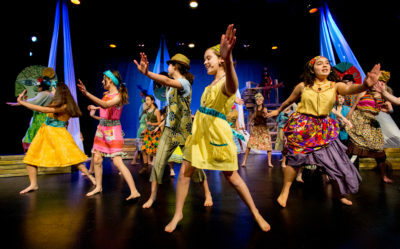 McCabe’s renowned teachers and students share their musical wit and wisdom with lively performances and demos. Hosted by Head of Music School Denny Croy at the Monica Film Center. It began in 1958. Furniture designer Gerald McCabe repaired guitars for his folk-singer wife’s musician friends who had no local music store. 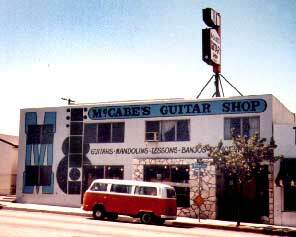 Gerald and his friend Ed Kahn decided to open a small music shop on Pico Blvd in Santa Monica. They began repairing instruments, selling folk music books and records, carrying Mexican guitars and old banjos. Word spread and local musicians began hanging out, relishing one of the only guitar shops in the Southern California area. 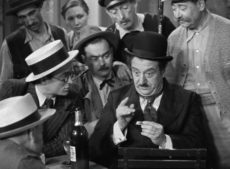 One of those young musicians was Bob Riskin. Bob started as an employee in 1960. In the early 60’s lessons and classes were added. In 1969 McCabe’s began presenting live concerts. Bob Riskin became sole owner in 1986. Bob and his wife Espie are still running McCabe’s today! Over the years, musicians from all aspects of the musical spectrum, from gifted amateurs to seasoned professionals, have come to appreciate McCabe’s friendly, knowledgeable sales staff, expert repair shop and world class teaching staff. Join us for memorable music from a local treasure!